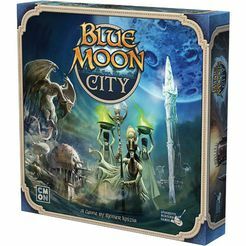 There are two mini-expansions for this game(Blue Moon City: Expansion Tile Sets 1 & 2) , each consisting of two tiles that can be added to the main game either separately or combined. The first mini-expansion was included with the Der Knizia Almanach. The second mini-expansion was included in the 6/06 issue of Spielbox. Original Knizia design--after dragon scales score, ALL players discard scales. This rule was modified by the publisher.